I hear you want to get fit and have fun. Well, I have just the thing for you! Starting January 20, 2011 Dance Dance Party Party will be up for it’s fourth season of awesomeness. This is the first time the class will have ran in the Winter session and I’m super pumped to get some new ladies out who want to exersize and have fun while they’re doing it. 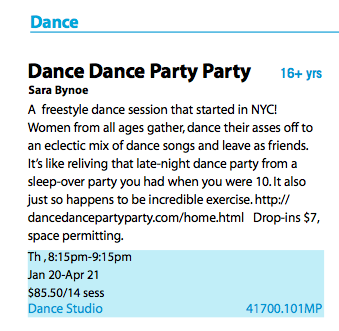 DDPP isn’t like most exercise classes; here the goal is fun first, cardio second.